I was skeptical when I read about the Somme Institute 5-Step Regimen, mostly because working in skin care I know that sometimes you can't even get people to follow a 3-step regimen. I gave this set to a friend who promised to try using it just as the website recommends (instructions are on the back of products as well) and after 14 days she called me and said that her skin was glowing! She felt that it was extremely helpful to have the dots on the products remind you what something is and how to use it: blue dot cleanse, purple dot exfoliate, orange dot serum, and so on. 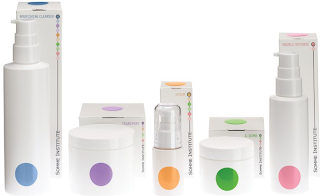 The Somme Institute 5-Step Regimen contains a patented technology that they refer to as MDT5 (Molecular Dispersion Technology) that delivers protein and vitamins (A, B3, B5, C and E) to your skin, transforming it by reducing signs of aging such as tone, texture, age spots and fine lines. This is a great way for someone who is interested in starting an anti-aging regimen that they don't have to think about. The products are affordable, very good quality and and Somme Institute makes it incredibly simple for even those that know very little about skin care to follow a fabulous 5-step routine. This is the system I use and I'm very happy with it. Beauty.com has a great set with the 3 most essential items for $160 so when I am ready to replace items that's what I'll buy. Then I can use my other goodies in conjunction with Somme.